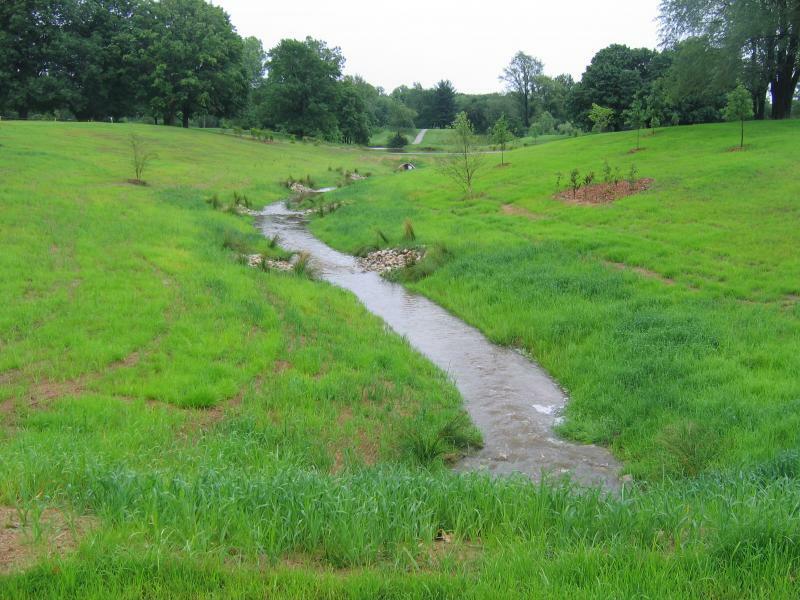 The project consisted of the removal of approximately 1400 feet of storm sewer piping and the creation of an open channel as stream bank mitigation for encapsulation of a segment of stream at a separate project site. The project includes the construction of five 42” diameter culvert crossings, approximately 3000 cubic yards of excavation, adjustment to 6-inch and 10-inch irrigation lines, placement of four glacial stone riffle structures for long term grade control, extensive erosion control features and native seeding. McCormick Engineering, LLC prepared construction plans, cost estimates, technical specification and contract documents for the project. Other design considerations included coordination with existing utilities, Federal (US. Army Corps of Engineers) and State (Indiana Department of Environmental Management) permit extension coordination, and bidding services. McCormick Engineering, LLC provided construction observation services on a part-time basis for this project completed June 2010.